Eeek! 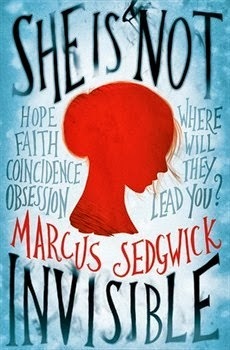 How does a writer ever answer that perennial question: what are your favourite books? It’s just too hard. 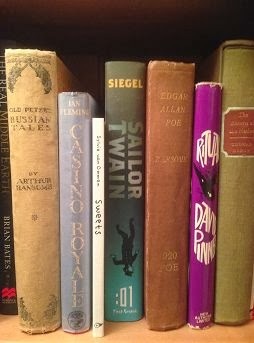 I’m on record elsewhere with a list of some of my top authors, the ones I couldn’t live without; people like Mervyn Peake, Ernest Hemingway, Bram Stoker, Hermann Melville. So instead, I thought I’d take a snap of one of my bookshelves – the one where I put treasures. 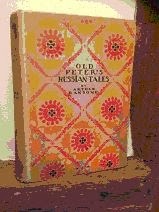 Old Peter’s Russian Tales, by Arthur Ransome. Arthur Ransome is best known for his Swallows and Amazons series of books, but when I was a boy I not only read and re-read those books, I also did the same with his collection of Russian Fairy Tales. It was a book that inspired me heavily when I came to write my novel Blood Red, Snow White, which is the true story of Ransome’s adventures in the Russian Revolution, as a British spy and a Bolshevik double-agent. I treated myself to this first edition a few years ago, and, because Ransome is not that popular anymore, it was a bargain. 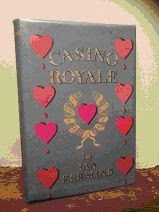 The next book on the shelf is another first edition: Casino Royale. I am a MASSIVE Fleming fan. Well, not the man perhaps, but of some of the finest thrillers ever written: the adventures of James Bond. It’s a beautiful book; and it’s true to say they don’t make them like that anymore. 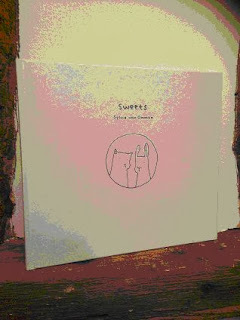 But I don’t treat this as a book not to be touched. It’s got to be read, or what’s the point? Next along, one of the best picture books ever! It’s a Dutch book called Sweets, and it’s a beautiful snapshot of a day in the life of two friends, a rabbit and a cat, who text each other to meet in the park, and there they wonder whether there will be Sweets in Heaven… I don’t know anyone who doesn’t cry, happily, when they read this book. 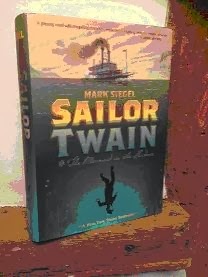 A very recent addition to my shelf of treasures is this awesome graphic novel, Sailor Twain, written and illustrated by Mark Siegel. The next book is a weird one: Arthur Ransome again, this time with one of the biographies he wrote before he became a writer of fiction. This one is of another one of my heroes: Edgar Allan Poe. It was a pretty uncontroversial book, unlike Ransome’s biography of Oscar Wilde, which got him in trouble. He was sued by Lord Alfred Douglas, also known as Bosie: Wilde’s lover. Ransome survived the trial but it brought him to national attention long before revolutions or Swallows and Amazons. Finally, a wonderful work of fiction. 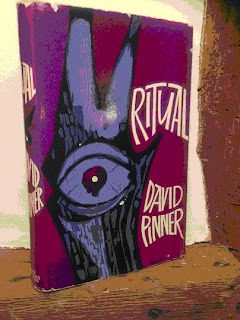 Ritual, by David Pinner. This book is the book that inspired one wonderful film version and one terrible one; both called The Wicker Man. I LOVE this book, despite the fact that it has continually been derided by most critics, both at the time of publication and since. Partially it got caught up in the publicity machine of the (first) movie it spawned, who wished to distance it from their film. Whatever the truth, it’s a book that means a lot to me, because when I read it, it was the first book IN A VERY LONG TIME that excited me about what fiction can do, what it can be. It is, in short, a bookshelf requirement. Thank you so much, Marcus! It was wonderful to see some of your favourite books. 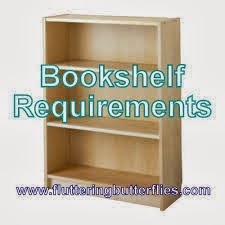 What would you pick for your bookshelf requirements?